It was a both a blessing and a heartache to be present at the recent special session of the General Conference of the United Methodist Church in St. Louis, MO (Feb. 23-26) as part of the team of translators (French). If you are not aware of the recent actions of the General Conference, click here for a helpful and hopeful summary of the event by my Bishop, Tracey Malone . Several weeks after my dad died, while I was still in the tender and raw stages of grief, I received an unusual condolence card. I opened the card and out fell 100 $1 bills along with this note, "When I have been deep in grief, it often helps me to be generous with others. I offer you these bills to generously give to others in whatever way is meaningful to you. I know this will not eliminate your grief, but perhaps it will ease it just a bit." What an amazing, generous and thought provoking gesture! Immediately my mind shifted from my own pain to how I might in some small way ease the pain of others. A gossamer thread of healing began to wrap gently around my own aching heart as I pondered how to grieve with generosity. I held onto the money for months, pondering all the possibilities of how to pass it on. 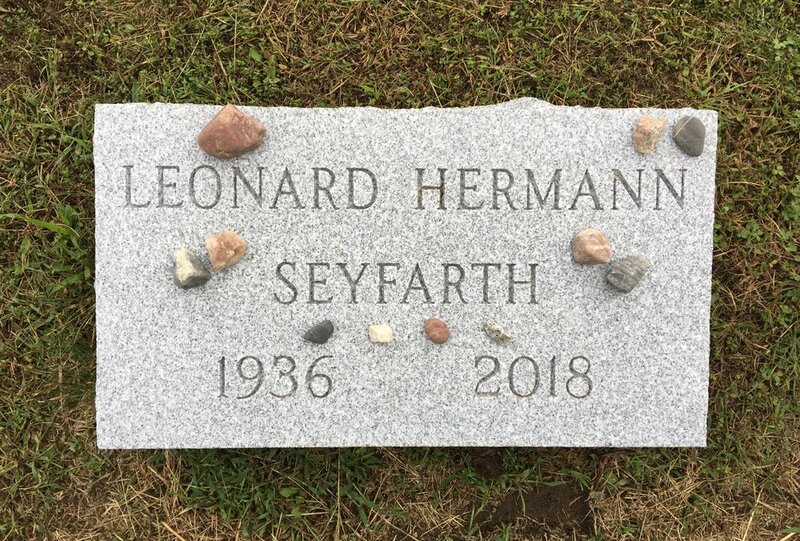 Finally, last month as I was heading to upstate NY to return my dad's ashes to his beloved Lake Champlain, the time seemed right. I traveled by plane, bus and automobile to get there. Throughout my travels, I quietly, but joyfully left bits of my "generous grieving" money along the way. In the airport, I left dollar bills in random places. At the bus station, I left money to help with bus tickets for others. On the seat of the bus driver, I dropped a handful of bills on my way out the door. And on the drive out to Wilsboro Point, we stopped at a Dollar General Store where I left dollar bills tucked into children's books that only cost a dollar each. All were small little gestures, but the opportunity to be generous in memory of my dad warmed my heart each time. To my friend who sent me this gracious gift (you know who you are!) I am forever grateful for your generosity with me so that I could grieve generously. What a healing gift you gave to me and so many others along the way. As my dad would say, Thank you! Thank you! Thank you! I'm an easy laugh, always in reach. I am geese in flight, come to carry you home. "Do not stand by my grave and weep." In the spirit of my dad's love of both the silly and the serious (the cheese and rutabaga moments of life) I share with you this silly story about the serious topic of Dad's ashes. My parents are avid recyclers and reuse old containers over and over again. 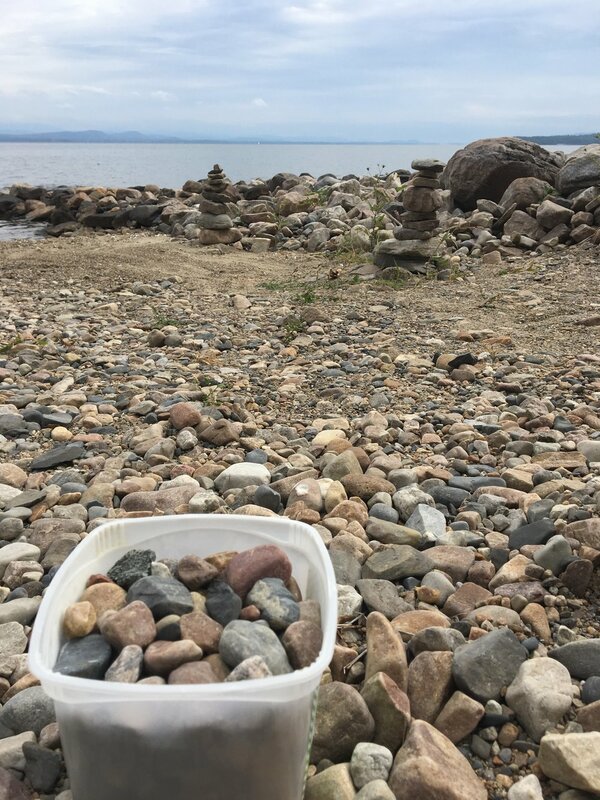 So, when my mom was recently dividing up Dad's ashes (some for me, some for my sister, some to scatter at Lake Champlain), I jokingly said to her, "I hope you didn't use an old deli meat container for Dad's ashes!" She paused, smiled and responded, "Of course not. I thought a potato salad container would work better!" My dad would have loved this! I can just see him grinning conspiratorially, throwing his head back, and letting out a hearty belly laugh! We would do well to remember that it is often the ordinary objects and events of life that hold precious meaning. What are the proverbial potato salad containers of your life that contain precious memories? Family dinners? Driving kids to school? Phone calls with friends? Meaningful conversations with a coworker? May we open our eyes to the "precious ordinary" in what we see and experience today and every day. My dad wrote this poem for Easter two years ago - 8 months after his initial diagnosis with stage IV prostate cancer. It wasn't his last Easter with us at that time, but this year it was. I recorded this video of my dad reading the poem a few weeks before his death. His absence leaves a huge hole in our lives, but the hole is not empty..."it is filled by the futures, taking place." This is likely my last Easter here, with you all. for Deborah to grow into. if they, indeed, get there, on beyond the mandalas and spiritual growth. to fill for a while. stage four prostate cancer, bone metastasis, stabilized with Lupron. I'm getting ready for bigger ones to come. They are being filled by the futures, taking place. which changes to each hearer, each telling. Note: I made this recording of my dad reading his poem during one of our Thursday morning breakfasts together at Joe's diner last year. "Sunny" in the poem is my mom, his wife of 53 years. Enjoy! "My hope is to have a joyful death." That was my dad's response when asked by the palliative care nurse what his hopes were for this final chapter of his life. In our culture that idolizes youth and fights death at every turn, his response is a beautiful anomaly. Certainly, none of us wishes to hasten the arrival of our own final days. And, sadly death all too often comes suddenly and/or violently with no chance for reflection. However, if given the opportunity when it is our time, how will we choose to face the end of our earthly life? Our usual response is simply not to talk about it; to pretend that we aren't all a step closer to death with each and every breath. However, my dad's response has been just the opposite. As has always been his style, he wants to talk about it. He has asked to talk with each member of our family alone - a chance to openly and honestly explore the language of our hearts. Together we listen, laugh, cry, sit silently and fumble for words. Through these conversations about his upcoming death, my dad is gifting us with an even deeper appreciation of what it means to be fully alive. FALLOW - My word for the year is an odd one this time around. Initially I thought my word would be something lovely and inspiring like "light" or "grace." However, during this winter season of hibernation and rest, the unexpected word FALLOW has been percolating within me. Perhaps is it time for me to "lie fallow" for awhile? Perhaps this is the season for me to tend the fields that have already been sown, but not to plant any new seeds - to let the soil of my soul rest and replenish? Reflecting and praying with this idea has already infused new life into my weary spirit. I invite you to consider what "lying fallow" might mean to you. Where do you need to rest for a season so that you can tend to the fields that have already been planted? Hold tight to the reassurance that God is good and God is with you through every season - even the fallow times. Thanks be to God! Walk slowly on purpose - We often don't realize how fast we are walking from one thing to the next. Even when we aren't in a rush, we rush out of habit. Next time you are rushing from here to there, purposefully slow your pace, breath deeply and remember the reason for the season. Take 10 minutes to eat one Christmas cookie - You may think that I have lost my mind with this one, but bear with me. We are so often eating in a rush - grabbing lunch, snack or treat on the go. Why not slow down, take just one cookie, savor it and delight in the flavors of the season. Cell phone Sabbath - Turn off the phone. Yep, just turn it off. The cyber world will go on fine without you. Start with just a few minutes and build up to a few hours. Set your phone so you can receive emergency notifications if need be, but let the rest of it go for awhile. Freedom from the constant pings can be a much needed breath of fresh air. One of my daughter's friends is staying with us several night's a week this year so that she can graduate from high school in the district she has been attending since kindergarten. It is fun having a "second daughter" for a few months! For Halloween they even dressed up like Daphne and Velma with Bear as their honorary Scooby Doo! Especially as we approach Thanksgiving, I give thanks for their lifelong friendship, their unwavering support of one another and their frequent fits of giggles. In a recent conversation with Abby's mom, she commented that hearing their laughter is like "kisses on my heart as a mother." I couldn't agree more! On days when the weight of the world can feel almost too heavy to bear, I pray that I may have ears to hear the God-given gift of giggles. Gracious God, may we receive the gift of your joy in our daily lives. And in turn, we offer you the gift of our laughter like "kisses on a mother's heart." Thanks be to God!